The rain has been pouring down all day and with increasing fury as daylight faded behind the night’s heavy clouds. Yet I sit outside, braving the storm on a humid terrace under a dry umbrella. The night is roaring thunder – its rolling downhill from a stone street, bouncing off the exposed rocks. It frightens with sharp intensity. It grumbles like a hungry stomach with a strong metabolism. And it is expected but shouts long after patient prediction permits. It is close. The lightning was less than five seconds ago. The electricity skipped a beat in-between. Strike. Lightning. Pop. Complete darkness. Crackle. Electric light flickers. Boom! Thunder. I said I was braving the weather: did I mention the half liter of local Melnik red wine keeping me composed? If you’re keeping up, then yeah, there’s atmosphere tonight. Maybe too much rain for wine harvest season. Either way it compliments this tiny town. Advertised as “Bulgaria’s smallest town,” Melnik has much more essence than a simple trivia answer. It has an old tradition with wine cellars carved into the mountain just as the wind shapes the scattered mountain tops of the surrounding landscape. 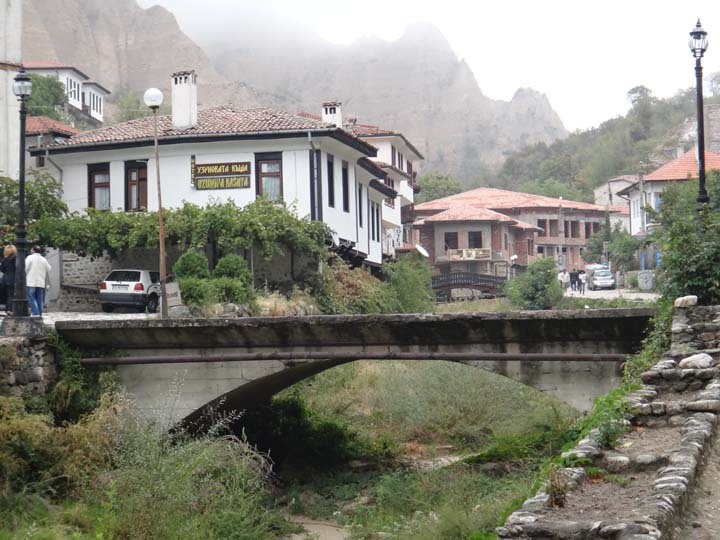 Melnik seems to be tucked into a tiny valley, narrow like a wild stream after a downpour. I visited two wine cellars. The main one Kordopulov, Melnik’s pride, is a heritage house with extra large wine barrels and a ruined chapel on the way to it. 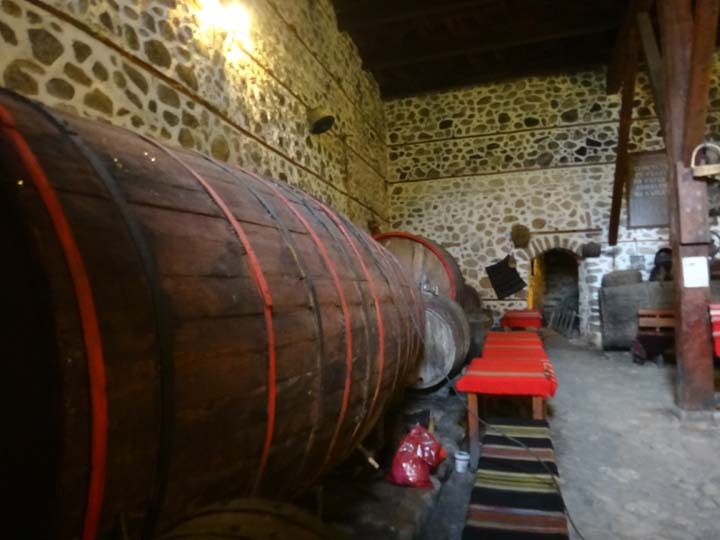 The other one, Shestaka Cellar, is the one you find by accident while trying to find the popular one. Not to condescend it,: it iss Shaman-esque wine made by a six-fingered hand family who passes that mystical trait down every second generation. The relative I met – his brother has it, as does his grandfather. 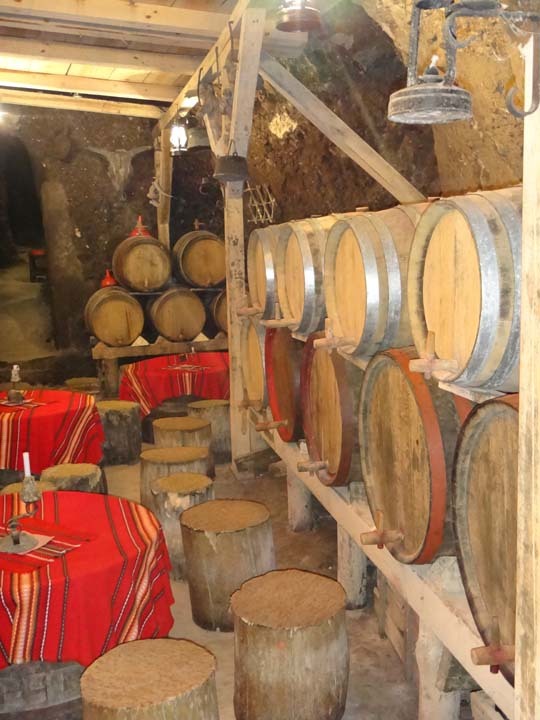 Kordopulov wine cellar has a museum house and a cellar that tangles briefly but impressively under a mountain. First, there is an ancient lady who gives you two one-leva tickets in exchange for your entrance fee. 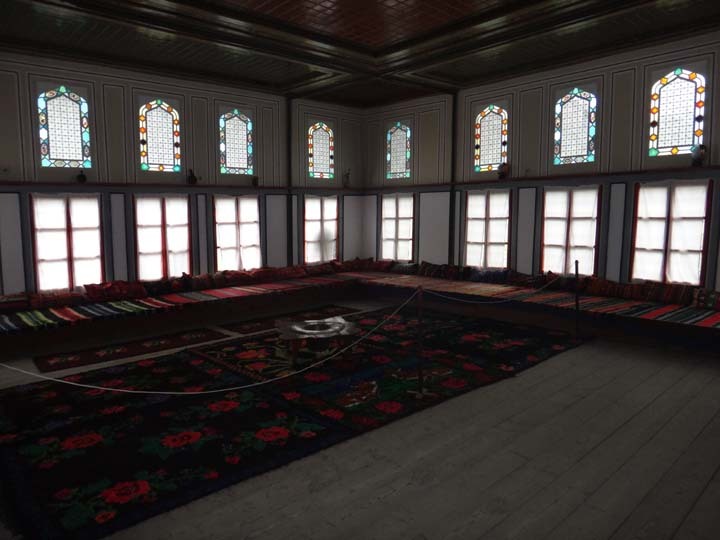 The house is a mix of Italian-Franco Mediterranean woodwork with Turkish influenced carpets and blankets. Upstairs there is an attic with a door to a terrace. It seems to be placed backwards on the wrong side of the house. There is barely a view; only extreme closeup of mountain side. I circle the terrace and approach the door to leave. But wait. Creepers, something is fluttering in front of the dark attic’s flickering light. 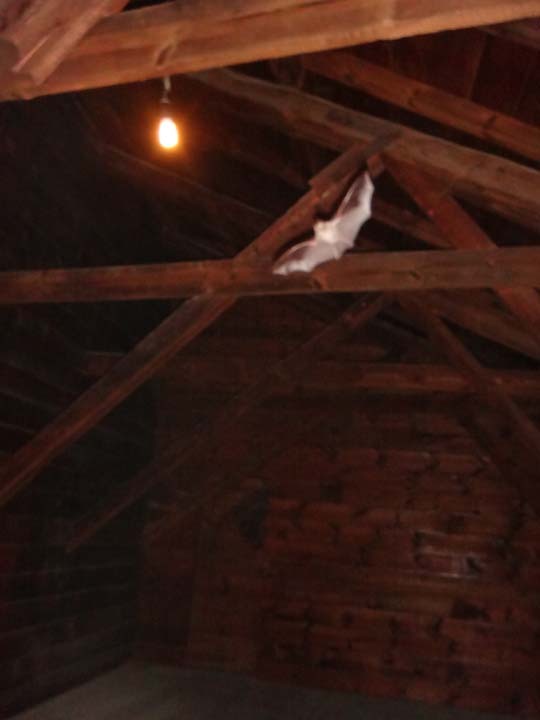 Is that a bird – no, a large moth. Oh no, it’s flying in a rhythmical trance, in a figure eight pattern. It’s approaching the door, seemingly wanting to escape its trap. But a normal flying creature would recognize the light and, like all god-fearing men, would approach the light with full on enthusiasm, like those soaked tourists seeking shelter under an awning in this storm. This small creature with great agility and slender swooping flight patterns is none other than a bat. I need to head to the wine cellar, but how do I cross the bat when his figure eight flying pattern intersects right in front of the door I need to exit by. By sucking it up, that’s how! And making a run for it (and two false starts!). The smiling guys working the wine tasting were hardly charming or sophisticated. That much I could understand through the language barrier. But the one who gave his attention was generous with his sampling as he was with his sharing of resources. I bought their premium bottle for five euros. Upon returning to my quality and affordable hotel room, the rain began to trickle down. Great timing for a siesta. I woke up hungry in my dark room to either the pounding or the sharp flashing of the storm outside. I pulled my sweater’s collar over my head and splash my way around the building’s stone path to the restaurant out front. I’ve had my dinner now and notice a beige, a chickpea-like colored fly, drowning in my half liter. I fork him out – no spoon to choose. I place him in my empty clay bowl that has no trace of the delicious pork and sausage sauté with peppers, onions and a fried egg that was so recently served in it. The fly is stumbling in circles, pacing back and forth on the left side of the bowl. It is completely drunk. I know this. I’ve got a solid buzz going too. One wing opens and then freezes in that spot. He looks dead. He’s not moving. I give it a breath of CPR. It shakes out of it. Moving into the dish it gains confidence. Maybe too much. It flies off like a failing transmission climbing up a steep slope into the stormy weather. I really love this town. It’s an easy decision: I’m going to stay another night.